The BJP has no left stone unturned to claim that demonetisation has been a roaring success, in terms of public appeal. It had even claimed results of civic elections in Maharashtra as a referendum on the note-ban. It is no surprise then that BJP's stupendous victory in Uttar Pradesh's Assembly polls is also being tom-tommed as the general public's thumbs-up to demonetisation. However, a voice of skepticism over the movie has now come from, hold your breath, the Rashtriya Swayamsevak Sangh. 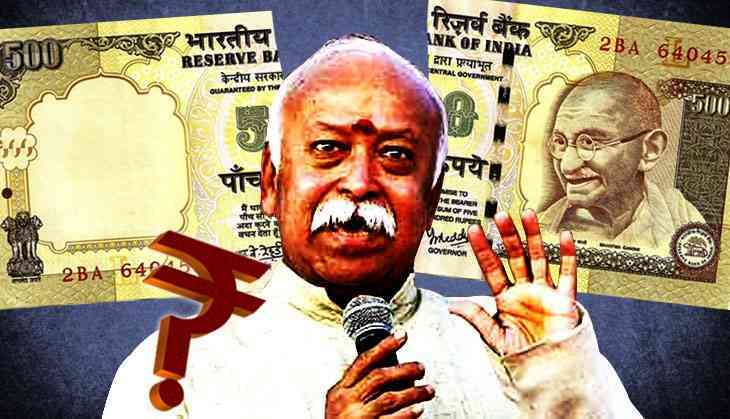 A report presented by RSS' General Secretary (Sarkaryavah) Suresh Bhaiyyaji Joshi at the organisation's annual congregation in Coimbatore, Akhil Bharatiya Pratinidhi Sabha (ABPS), has indicated that the RSS has essentially reserved its judgment on demonetisation. In its annual round-up of the country's landscape, the report refers to three events that it considers landmark – the 'surgical strikes', demonetisation and ISRO's launching of 104 satellites. The report hailed demonetisation as a “courageous” decision following which everybody has seen a “different” India. The report goes on – “Of course, common people had to go through some difficulties, which was natural. People exhibited unprecedented patience and patriotism. It was a welcome move, as a step in the direction of elimination of problems like black money, fake currency, terror-financing”. However, the assessment ends on a cautious note as it says, “How appropriately-timed and effective the the decision was, will be proved only in the future”. This careful articulation of the RSS's latest stand on the issue is a recalibration of the warm-hearted response it had extended initially. The Sangh had hailed the note-ban in November, 2016, saying that the decision was in “national interest” and that it had brought “all anti-national, separatist and terrorist activities in the country...to a sudden halt”. This restrained response indicates RSS's hesitation in lauding the move as enthusiastically as before. The reason behind this change in tenor is not clear. While many observers have agreed with the pro-note-ban camp in acknowledging the impact of the move in BJP's favour in Uttar Pradesh, no-one has attempted to answer why this 'euphoria' failed to make BJP the single largest party in all other 4 states that also went to polls along with UP. Also, the government is yet to come out with data that would empirically prove the effectiveness of the note-ban in meeting the declared objectives. The data, if anything, has only admitted a dent to the economy in the short-term and medium-term. Unlike demonetisation, the report has endorsed the purported 'surgical strikes' whole-heartedly, expressing RSS's appreciation and support. The state of affairs in two states, West Bengal and Kerala, have found a special mention, as examples of what the report calls “attempts to instil fear in the Hindu society through violence” and “use of force and political intolerance to intimidate supporters of their ideology”. It mentions last year's violence in West Bengal's Malda and Dhulagarh areas and says “atrocities on Hindu society have gone up”. Without naming anybody, it accuses “those in power” of “heights of Muslim appeasement”. In Kerala, the report says “attacks on RSS-workers have gone up after the Left came to power” and an inhuman face has come out openly. RSS has urged upon governments in both the states to act in a just manner and take steps to ensure establishment of peace and harmony. West Bengal appears to be a special area of attention this year as another document, released separately, has sought to attract attention to what RSS calls “Growing jehadi activities in West Bengal - a challenge to national interests”. It takes on the state government, unequivocally, expresseing “grave concern over the unabated rise in violence by Jehadi elements in West Bengal, encouragement to the anti-national elements by the state government due to its Muslim vote bank politics and declining Hindu population in the state”. It also claims that “extremists, fomenting trouble in a planned manner, are being encouraged by giving ministerial berths and other prominent political and government positions”. It accuses the state government of “overlooking the attempts to Islamise the schools” and also presents decline in Hindu population of the state from 78.45 % in 1951 to 70.54% in 2011 as “a matter of serious concern to the unity and integrity of the country”. The ABPS calls upon everybody, from the state government to union government and from “countrymen” to the media to acknowledge and “ensure firm action against these anti national Jehadi elements of the state in the interest of national security”.